Like a great shadow’s last embellishment." The scent for this day is Aurora liquid perfume. The mythological messenger God, who carried the dreams of Morpheus is associated with Wednesday. In keeping with this mercurial theme, it seemed appropriate to bring this news to you this Mercury day. As my daughter and I walked to the car early this morning we noticed a heavy, floral fragrance in the crisp morning air. It literally stopped both of us in our tracks. The intoxicating bouquet was a combination of sweet greens with jasmine. The Jasminum polyanthum is in full aromatic display now and her warm, exotic fragrance fills the air. 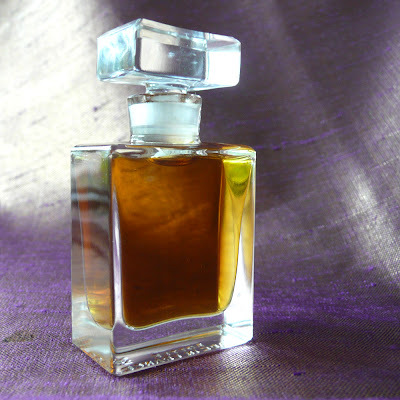 Aurora is a floral perfume with threads of spice reminiscent of carnations. Heart notes include Jasmine as well as Rose and Ylang Ylang. "What beautiful, twinkling magic has been weaved in this amazing, heart-moving fragrance? Because it is surely magic, or at the very least the magic of art and love, that make this fragrance evolve so stunningly on the skin, going through countless transformations that seduce the senses one after the other..."